In 2013, a progressive entrepreneur came to AppSaloon and asked us to create a WordPress Website with a built-in tool to give friends and family the opportunity to show their support to the relatives of a deceased. Over the years, this tool became a full fledged WordPress plugin to not only condole but also give families the possibility to reply on these condolences and to let people register to the funeral reception. You can create custom posts right in your WordPress install with info and an image of the deceased. You can even add a pdf or image of the original obituary to this post and add per obituary a link to your flowershop. It became a premium WordPress plugin that every funeral director needs. The development of the tool took two years. 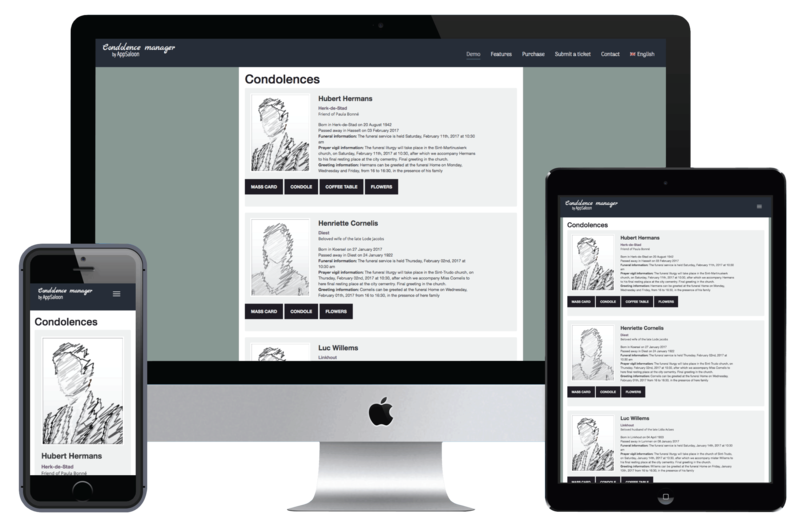 On the basis of trial and error, and thanks to the input of some funeral directors, we can introduce you, with some pride, our first premium plugin: The Condolence Manager Plugin by AppSaloon. Be sure to visit our website where you can view a live demo and create a custom obituary.